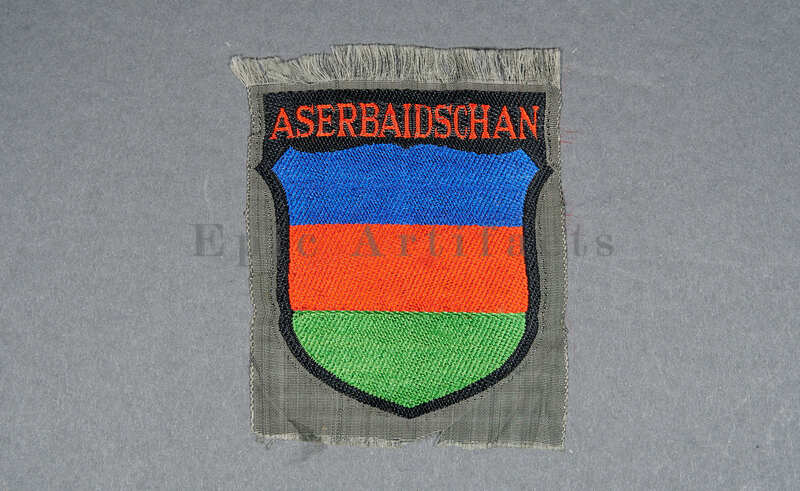 Product Description: Unissued original example of the Aserbaidschan Volunteer Sleeve Shield. 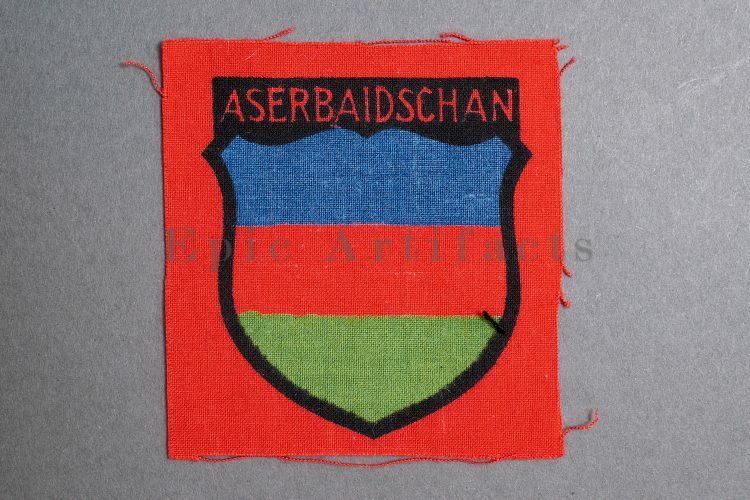 This insignia was introduced in 1942, to be worn on the tunic sleeve by men of the Aserbaidschan Legion, later used to form the German Army 162. 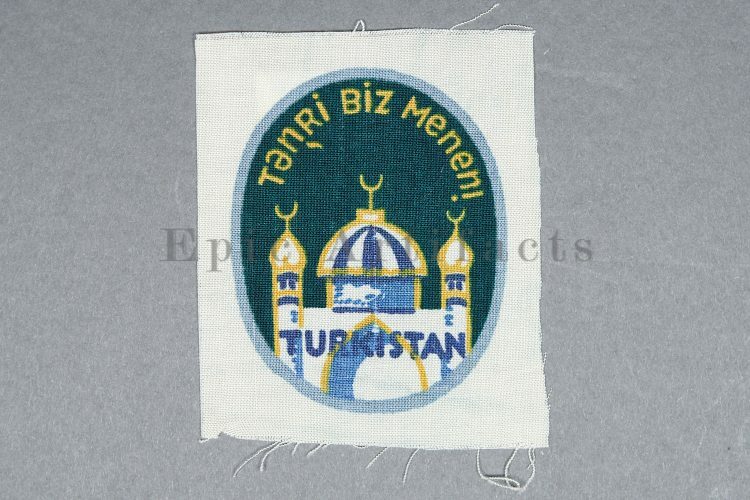 (Turkestan) Infanterie-Division. This one is the desirable, first pattern Bevo version, which is harder to find than the later printed type. It’s machine woven, with a Feldgrau (field gray) rayon backing. 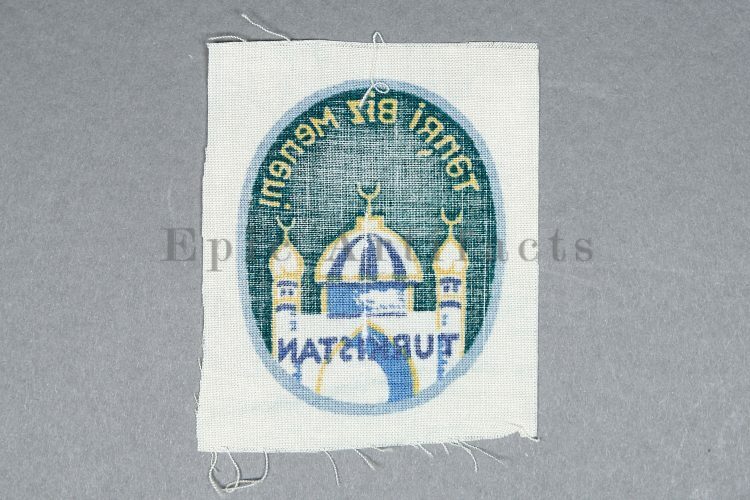 It has never been sewn on a tunic, or even folded, and is in near mint condition. It’s a great, textbook example of the early type Aserbaidschan Volunteer Sleeve Shield. Historical Description: As German military power stretched across Europe, many people in the occupied countries volunteered to fight for the German cause. Some were ideologues, some were opportunists, some probably “volunteered” because they had no other choice. In some areas, the Germans eagerly sought volunteers; in others, the Germans were less trusting, and the formation of volunteer units proceeded slowly. But by the end of the war, approximately one million foreign volunteers and conscripts were among those who had fought under Hitler. 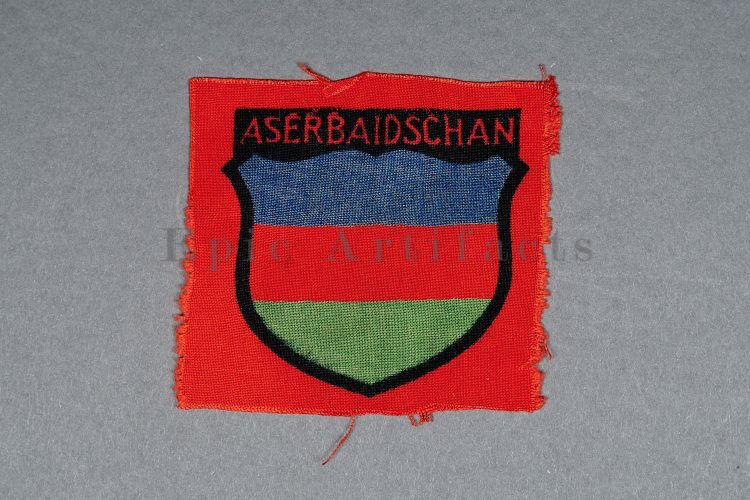 To distinguish these from German troops, and as a mark of distinction, the Germans authorized special insignia for wear by these volunteers. 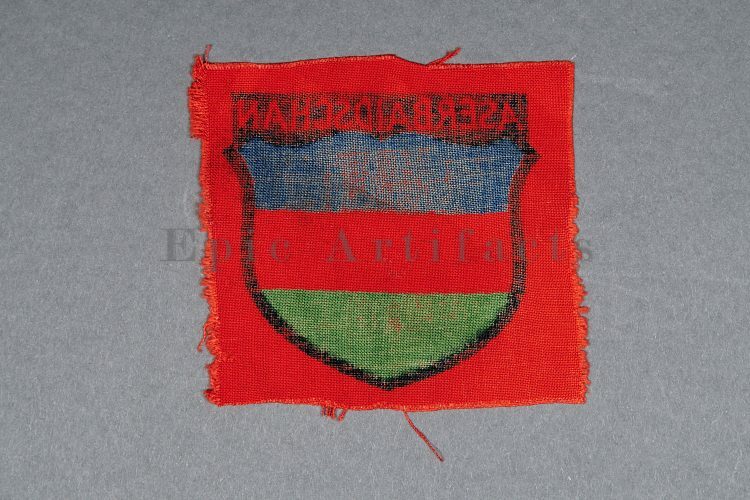 The insignia took the form of a cloth shield, either woven, embroidered, or printed, that was to be sewn on the uniform sleeve. 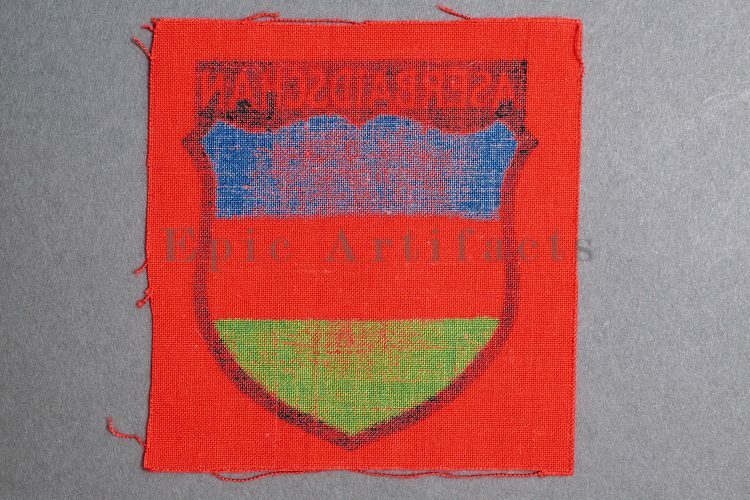 Some of the foreign volunteer shields were used by specific units of the German Army or Waffen-SS. 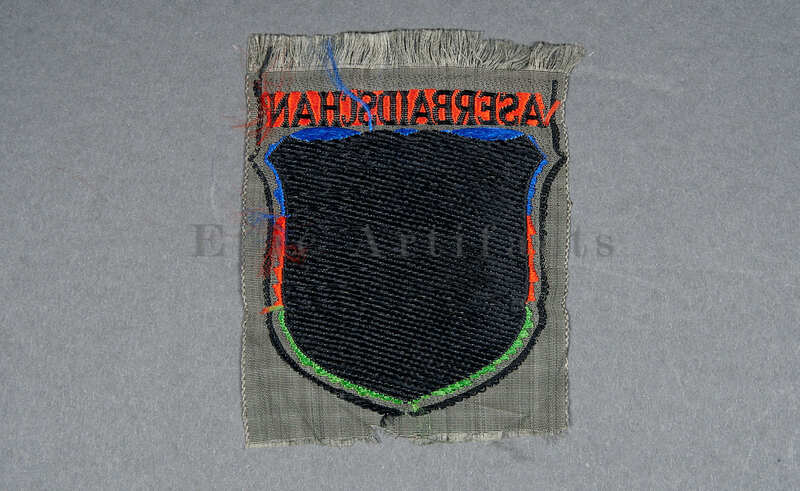 Others were worn by members of a variety of units and even paramilitary organizations. The design of each shield was chosen to represent the wearer’s nationality. Some were as simple as a national flag or colors, others had more complex designs.